I had the great pleasure of mentoring two very special little girls today – Isabelle (in navy) and Eden (in pink). Isabelle especially is interested in being her own boss someday. She’s so interested in entrepreneurship that she’s started not one, but TWO businesses. Isabelle sells handmade jewelry to her parents’ friends and has a small concession stand at her Daddy’s biathlon races. She was intrigued to hear about Etsy as an outlet for her handmade jewelry. The impressive thing about her concessions business? She started it, on her own initiative, at the tender age of 7. I met her Daddy (Dave) on a long plane ride to New York. We ended up talking so much that the poor guy in between us (in the dreaded middle seat) finally switched with Dave so we could jabber away with impunity. When he told me of his daughter, 9 year old Isabelle, and her natural inclination to make money, I was impressed! It was an honor to host the entire family today. They took a tour of the Bramble Berry warehouse. Isabelle diligently took notes on unfamiliar terms (such as COGS, low cost provider, commodity) while her younger sister Eden added little nuggets to our conversation. 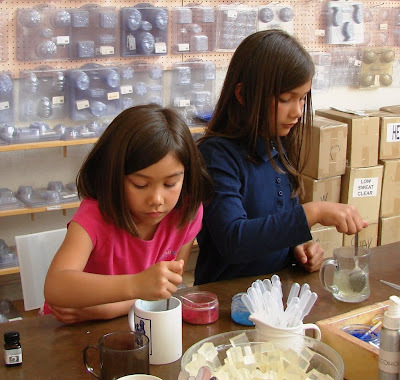 We finished the day with the fun part – making soap at Otion. 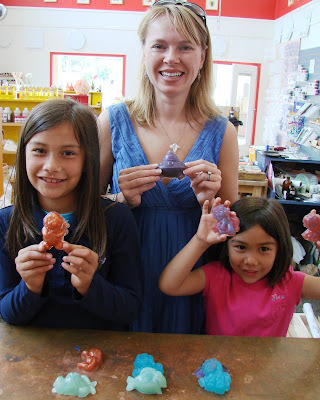 The girls made creative and colorful soaps based on their interests (ponies and fish). They were a delight to be around at all times, quick witted and exceedingly bright. They both have impressive futures awaiting them. Thank you Isabelle and Eden for an enjoyable afternoon. It was a pleasure to spend time with both of you. Isabelle, I’m looking forward to watching your business grow in the upcoming years. I love working with kids. They really want to learn and it always amazes me how much they pick up. The most I have done with my kids with soap is melt and pour (or making some soapwort shampoo) but I think they really had fun doing it. BTW, that’s a great picture of you with Isabelle and Eden. OH Anne Marie…I wish we could do that with ours!! What a neat family outing! They were really fabulous girls. I couldn’t get over how well behaved and exceedingly bright they were. Their parents, Dave and Christy, really work hard to ensure that their girls are well-rounded, polite, and gracious little people. They’re definitely succeeding. How charming you make a great mentor Anne-Marie, even if it’s just for a day. Isn’t it great how we meet some really special people! Sounds like a great day for all involved. I am impressed to see someone so young with such an entrepreneurial spirit and drive. Wow! That is impressive! She even took notes! …and so are the meager shots of the Otion store behind you all! You should do a 3D photo gallery tour of the store! Sounds like a wonderful day. It is so cool to see parents willing to nurture their children’s dreams. Way to go, parents of Isabelle & Eden! I’d say smart beautiful talented young ladies~ looks like they some great soap! Their dad must be very proud of them.